Powder Coating Website To Be Top-Ranking! If you're an expert powder coater, painter, metal fabrication shop, metal finisher, metal arts designer, or you just want to have a top-ranking website for your metal finishing or other art designs website, I will promote your services as being the best in Wisconsin, Iowa - or your own local area - and beyond. I currently work with businesses in the states of Wisconsin and Iowa to help them promote and advertise their metal fabrication and finishing services, powder coating and professional CARC painting services, as well as, other metal cutting art designs and cut metal parts. 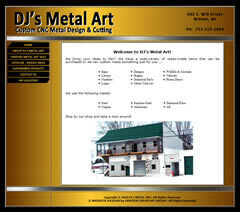 DJ's Metal Art - This top Withee, Wisconsin, business has only had his metal finishing designs website up on the net for less than a week but we created his custom metal finished art designs and powdercoating website and optimized it throughout the entire creation process of the website. Just a short week after launching it, we are already currently seeing DJ's Metal Art website in the top (first) page for many of the generic search terms for metal art designs, metal finishing designs, metal cut art, and metal art designs. And, better yet, when you type in Wisconsin to the search term, they all come up on page 1. This has had tremendous results moving up very quickly through thousands of other metal cutting and metal finishing websites in Wisconsin! 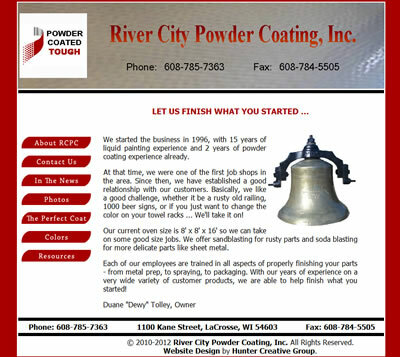 River City Powder Coating, Inc. - This professional powder coating (painting) business is located in LaCrosse, Wisconsin, and is already heading to the top with his top ranking expert website! His website was finished just about a week ago and it's already climbing up the ladder of search engine ranking. Update, he is already on page one for Wisconsin powdercoat painting and powdercoated metal paint in Wisconsin. Finished Metal Art Hangers by Hang-Em-High - Yet another LaCrosse, Wisconsin, website that is currently in the process of having their metal finishing and powder coating website created. This website information will be updated as it is finished uploading and starts moving to the top of the search engines. Update ... after doing search engine optimization on this website, it is now on the top (first) page for many search engine terms - such as: finished metal designs, finished metal art, metal wall art Wisconsin, and more! 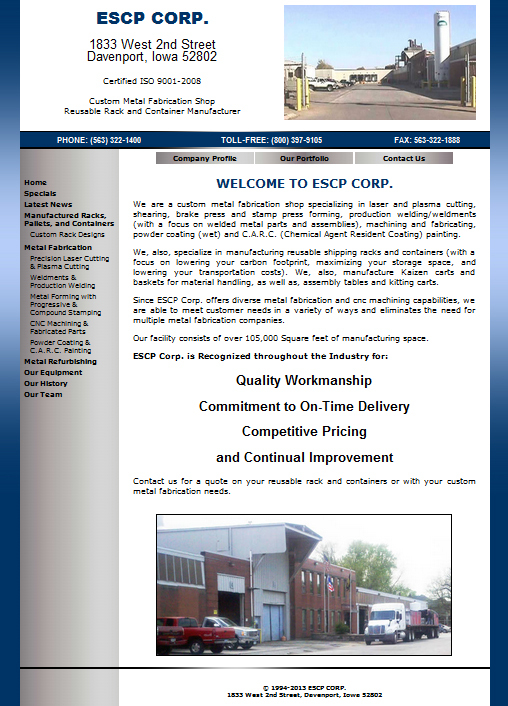 Custom Metal Fabrication, Powdercoat and CARC Paint Shop - ESCP Corporation is another newly top ranking metal finishing shop that has powdercoating and CARC painting services available in Davenport, Iowa. They are consistently getting ranked in the top 3 pages for many of their metal fabrication and powdercoating and CARC painting services. This website has only been getting recognized by the search engines within the past month of the newly redesigned website. We expect it to continue gaining priority in the metal fabrication search ranks. 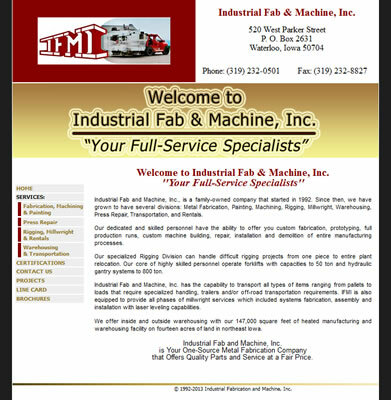 Custom Metal Fabricators, Powdercoating and Shot-Blasting Paint Shop - Newly completed, Industrial Fabrication and Machining, Inc. is just starting to get ranked as an industrial fabrication shop that provides metal fabrication services, powdercoating and shot-blasting painting, cnc machining, rigging and millwright, press repair, warehouse storage, and transportation and rentals. Even though the website has just been redesigned and optimized, they are now starting to come up in the top pages for many of their key words and phrases. We expect Industrial Fabrication and Machining, Inc. to gain more popularity and improve in the search results over the next few months. Please note that with millions of websites on the internet these days, it is simply not good enough to just have a website ... You have to do additional work to make it become listed in the top 10 pages. Also, it takes approximately 9-12 months for the full effects of any website optimization to be seen. However, sometimes, such as in the cases of Dj's Metal Art Custom CNC Machine Cutting and Designs, River City Powder Coating Painting Professionals, and Hang Em High Metal Cut Designs and Powder Coating Projects, it only took approximately 2 months for each of them to climb this high in the search engines rankings. Please be aware that if anyone promises they can get you top rankings in the search engines quicker, run the other way. No one can guarantee top rankings ... ONLY Google can guarantee your placement in the search engine rankings ... however, there ARE many things that you can do to help your website get good, strong, legitimate, rankings. Contact Hunter Creative Group today to see what we can do for your business today! We are Wisconsin and Iowa's Top Powder Coating, Custom Metal Fabrications, and Metal Finishing Website Designers.